Origin and Habitat: Scadoxus puniceus is native to much of southern and eastern Africa: Ethiopia, Sudan, Tanzania, Malawi, Mozambique, Zambia, Zimbabwe, Botswana, Swaziland, and South Africa (the Cape Provinces, KwaZulu-Natal, the Free State and the Northern Provinces). Habitat and ecology: Scadoxus puniceus can be found in cool, shady areas ranging from coastal bush and lowland acacia veld to the summits of the high mountains, in ravines, river valleys and forests. It flowers in spring and is always confined to shady, sheltered spots under trees and bushes or between boulders where it is often found in moist leaf litter. Sunbirds, weavers and other nectarivorous birds feed on the nectar produced by the flowers. The plants are dormant in winter and use the large bulbs and roots to store moisture during this period. Ripe berries eaten by birds / monkeys. S. puniceus and Scadoxus multiflorus form hybrids in SW. Tanzania. Haemanthus puniceus var. fortuita Herb. Haemanthus puniceus var. magnificus Herb. 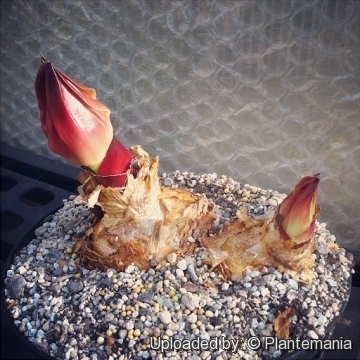 Haemanthus redouteanus var. subalbus M.Roem. Description: Scadoxus puniceus, also known as the paintbrush lily, is one of the most striking bulbous plants. It produces large dense heads (inflorescences) up to 15 cm across consisting of numerous smaller scarlet flowers. The flower stalk may reach up to 50-60(-75) cm and is often spotted with purple near the base. The spectacular flower-head are borne within bracts which may be large and varying from green to red, brown or dark violet. The filaments are a brilliant orange-scarlet, and are tipped with golden to orange-red anthers. The flowers often appear before the leaves. 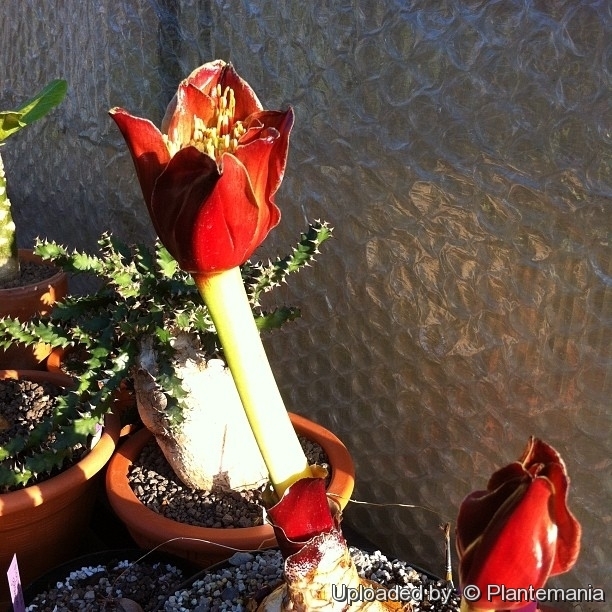 Previously classified as part of Haemanthus, it was separated mainly because of its stalked leaves (broad and stemless in Haemanthus). 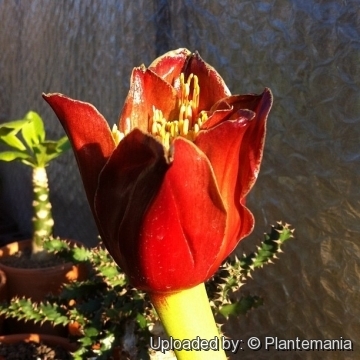 The paintbrush lily was formerly known as Haemanthus magnificus. The plant is cultivated as an ornamental. It was popular in the Netherlands as early as the beginning of the 18th century. This species is quite variable with a disjunct distribution and a number of different forms occur throughout its distribution range, but it has not been possible to find discontinuties distinct enough to make specific or subspecific delimitation. Derivation of specific name: The species name puniceus means "crimson, scarlet or purple". Bulb: Large, rhizomatous, underground up to 10 cm across and with a short thick stem at the base from which numerous fleshy roots arise. Leaves: Gossy green, 30-40 cm in length. They are held erect beside the inflorescence, their bases are tightly rolled to form a pseudostem (false stem), 5–50 cm long which has red/purple speckled scale at the base. Leaf-blade lanceolate to ovate, acute to acuminate, basally attenuate with wavy margins. Leaves often produced some time after anthesis. Inflorescence: Scape (15–) 20–40 (–75) cm long often spotted brown-red to dark violet. The young inflorescence, protected by involucral bracts and borne on the flower stalk, appears first, followed by the stem which bears 6-8 leaves. The involucral bracts remain intact and erect during anthesis, they are lanceolate to spathulate or rhombic, sometimes hastate, (2.5–)3–8.5 cm long, (0.7–)1–3.5 (–4) cm broad, red (in East Africa) to brown, violet or even green elsewhere. Inflorescence conical, (20–)30–100-flowered. Pedicels 1–2.5(–3.5)cm long. Flowers: Perianth colour pink to scarlet, outside East Africa also yellow-green and greenish pink, segments often paler than filaments. Perianth-tube cylindrical, 0.3–1.2 cm long; segments erect to somewhat patent, linear, 1.3–2.7 cm long, 0.7–2(–2.5) mm broad, (1–)3(–5)-nerved. Filaments filiform, 1.5–3.5 cm long at anthesis, anthers 1–3 mm long, red or yellow. Fruits: The bright red, round berries are about 5–10 mm wide, and each produces a single opalescent seed inside. 2) Wikipedia contributors. "Scadoxus puniceus." Wikipedia, The Free Encyclopedia. Wikipedia, The Free Encyclopedia, 10 Sep. 2016. Web. 10 Sep. 2016. 10) Pooley, E. “A Field Guide to the Wild Flowers of KwaZulu-Natal and the Eastern Region.” Natal Flora Publications Trust : Durban. 1998. Cultivation and Propagation: Scadoxus puniceus is grown as an ornamental plant for its brilliantly coloured flowers, either in containers or in the ground in where the climate is suitable. This species is winter-dormant, not frost-hardy and must be kept at a minimum temperature of 10°C. During the summer growing season, it should be kept moist. Soil: Open, well-drained growing medium, largely organic and well-drained. Do not move or disturb the bulb unnecessarily as flowering may be affected. Water requirements: It enjoys moisture in a well-drained situation and keep reasonably dry in winter. Pests and diseases:* Slugs and snails can make holes in the foliage if not controlled, and root-knot nematodes may stunt the plant's growth. Amaryllis lily borer can cause severe damage to the whole plant. Traditional uses: As within many of the closely related amaryllids, the bulb is considered poisonous in significant amounts and deaths have been reported following the ingestion. However this species is widely used in traditional medicine to treat coughs, gastro-intestinal problems, febrile colds, asthma, leprosy, sprains and bruises, and as an antidote to poisons. It is also used as a diuretic. The leaves are applied to sores and ulcers to aid healing and act as an antiseptic. The plant is also traditionally consumed during pregnancy as part of an herbal regime to ensure safe labour. Propagation: It is propagated by seed which must be sown fresh. Plants flower in 4-5 years from seeds.